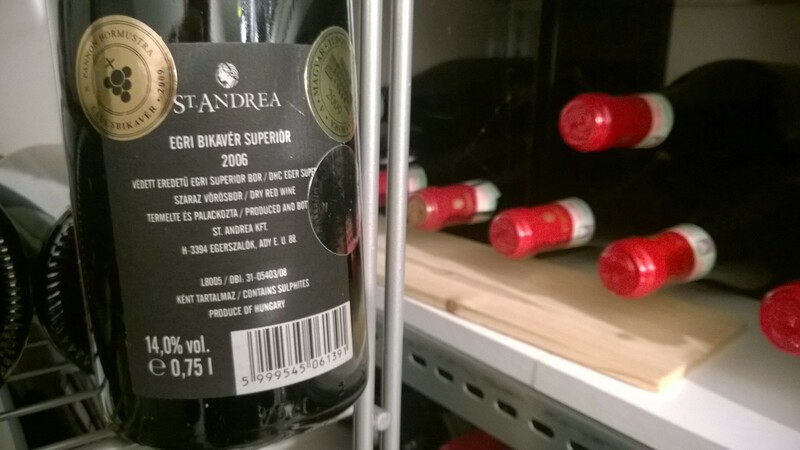 My favorite Hungarian wine maker is St. Andrea (http://www.standrea.hu/). So far I haven’t had a chance to visit them, although this is a producer I would really like to get to know. They produce a variety of wines: white and red, from typical grapes of the Eger wine region in Hungary, but also Pinot Noir. Most of the wines of St. Andrea are cuvées. While I’m a big fan of their Pinot Noir, the most prestigious and certainly also their top wine is called Merengö. It is a cuvée made from ca. 50% Kékfrankos, then Syrah, Merlot and Cabernet Franc. You may know Hungarian red wine. Lower quality isn’t actually drinkable, many medium wines are too ambitious, too woody and, more precisely, too oaky. Many of the better once aren’t still “decided”, which means they lack a final profile and the wine makers are still in the process of developing those. If they want to distinguish themselves from many Austrian wines (in particular from the Burgenland), they do need to find their own style – although the grapes and even the soil is in many aspects comparable. Of course, every wine region holds some surprises, but in my opinion Eger has become “the” region of Hungarian wine. Earlier than in other regions but also probably because they were in the shadow of Tokaj region (which is also in the northeast), you could buy wine from Eger and could find really good stuff. In my opinion, the best vintage of Merengö so far was 2006. And you unfortunately can get it anymore somewhere. it is very good to drink now! It is really unique: Kekfrankos and Cabernet Franc deliver the real taste like of Hungarian origin. But the both others sorts of grape which are in a wonderful balance to the main directions gives this wine something “southern”. The wine is remarkable rich, positively fruity but not heavy at all. Even you might open the bottle one hour before the wine remains to be really fresh. The fruitiness does not mean sweetness, but it makes this experience so unique. Simply speaking this is a wonderful combination. Berries from the forest but also a flavor of black cherries; last but not least very nice velvety and congenial dry. This is just a fantastic wine! Unfortunately, I haven’t tasted any Hungarian wine and I know I’ve been missing out but I think it’s a bit difficult to track down. I shall seek out for the one you recommend, though!